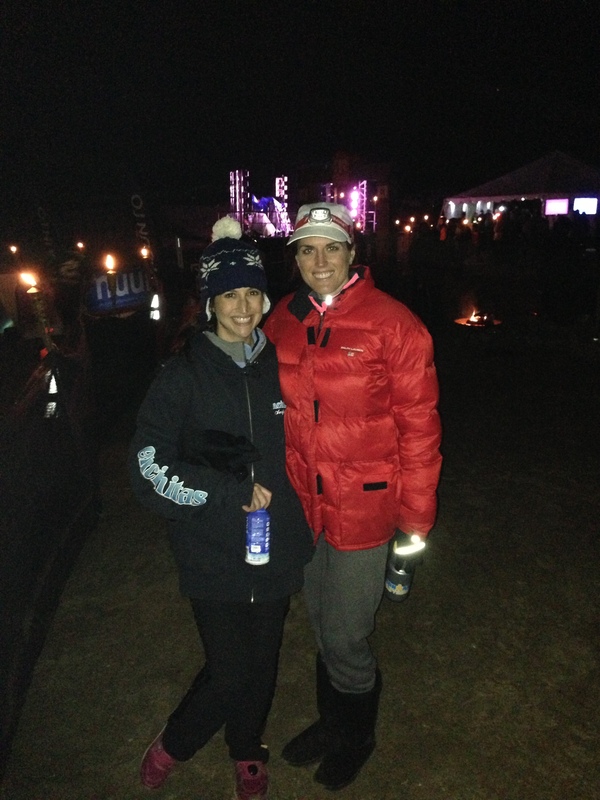 This is not my race report on the Ragnar Trail Vail Lake Relay but rather a review of the race itself. Since Ragnar Trail Races are in their inaugural year, there are definitely some kinks to be worked out by the organizers. However, overall the event was incredibly fun and well-organized and none of the cons would actually prevent me from racing again. I had a total blast! Below is a summary of how Ragnar trail works, some good things about the race, some not so good things and tips for future racers. 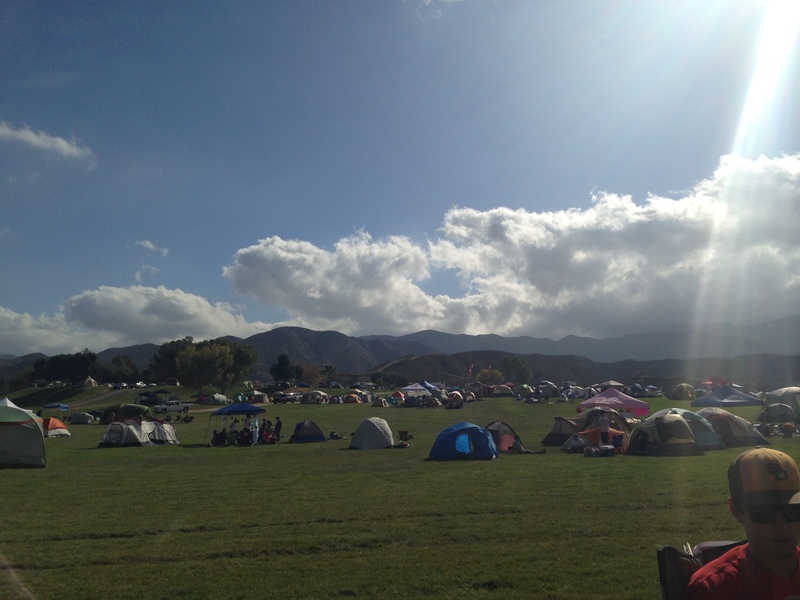 Unlike the traditional Ragnar races, Ragnar Trail races have a “base camp” where all teams are encouraged to create campsites and even set up tents to sleep in. There are 8 team members per traditional team and 4 per Ultra team and each team member will complete 3 different routes at varying lengths and difficulties, completing around 15 miles per person and 120 miles per team (assuming the trails are measured correctly, as they were not always for Ragnar Trail Vail Lake but I’ve heard that I have to throw my Type A Personality out the window when it comes to trail running and “just go with it”). They loops are color coded: Green for easiest, yellow for medium, and red for most difficult. Every team member is expected to run each leg one time. As you may expect, it’s not really possible to make a trail race course easy, so don’t expect green to be a walk in the park. Just as with traditional Ragnar races, you are given a start time on Friday based on how fast your team is (you will fill out your road race 10k pace online in advance) so that the majority of teams finish around the same time (i.e. mid to late morning or early afternoon). Base camp holds the transition area where team members can watch a TV screen which will warn them when their team member is within ¼ mile. All 3 loops converge at the end so that you always run the same 1/4-1/2 mile at the end of each route, ultimately hitting the same timing mat each time and alerting your team members that you are approaching. You are supposed to run each leg of the race in the same order, so assuming you are following this rule, you’d always be waiting on the same person to finish so that you can make your next loop. 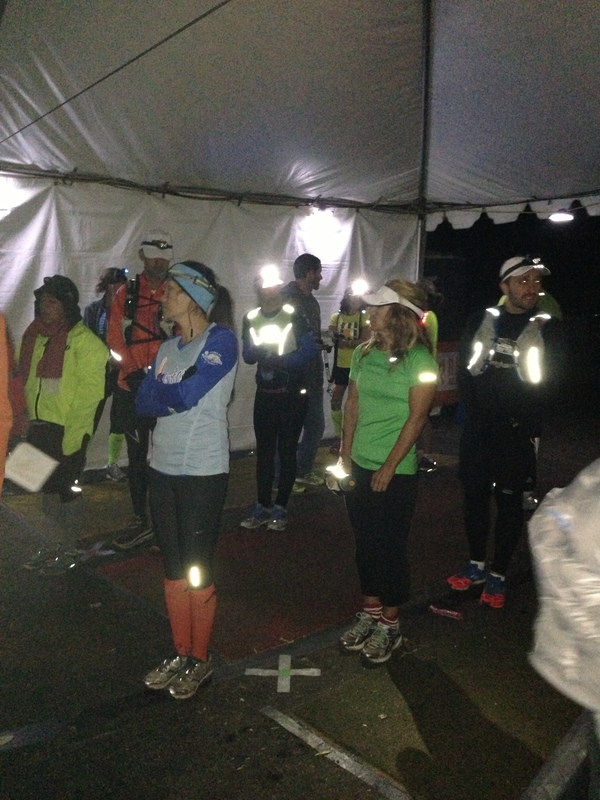 Once you know they are approaching, you go inside of the transition tent and wait in front of the colored mat of the loop you are about to run. The person approaching will enter the tent and run over the mat in the same color of the loop they just ran , which on the other side will show the color that you are about to run (i.e. coming in from green loop you’d run through a green mat onto a yellow mat). In transition, the runner will hand off the race belt with the bib and timing chip attached and remove the slap bracelet they were wearing in the color of the loop they just ran (green in this example) and the next runner will put on the new colored slap bracelet (yellow in this example). It seems to me based on our times that the transition time is reflected in the 2ndrunner’s time (i.e. chip timing begins as soon as the 1st runner crosses that mat). The trails themselves are marked very clearly with arrows with colored lights that correspond to your loop color. When running the red loop, stick with red lights. At times, two trails may be together and there will be two signs with two different colors. There are also other signs on the trails marked with warnings for things like cactus (in Vail Lake’s case) or very steep descents and a “X” warning notifying you that that is NOT the way to run. I found that the trails were marked so well that if at any time I wondered if I was lost, I’d see a trail marker within a minute. They were so close together that it was pretty hard to get lost (if you do find yourself lost and your team is wondering where you are, base camp will throw up a huge spotlight so that you can try to make your way home via the light). Despite being a novice trail runner and being a little hesitant about running in the dark initially, I wasn’t scared on the trails most of the time (when the thoughts of large wild animals crossed my mind or I hadn’t seen another runner in a while sometimes I’d spook myself) and it was fairly easy to see especially since it was nearly a full moon. At night I wore a headlamp and also carried a hand held flashlight for extra depth perception. Beautiful scenary and plenty of camping space. Salomon shoe trial – I was able to wear Salomon trail shoes for all 3 legs of the race which not only helped with traction on the wet trails but also meant that my own shoes stayed dry and clean! 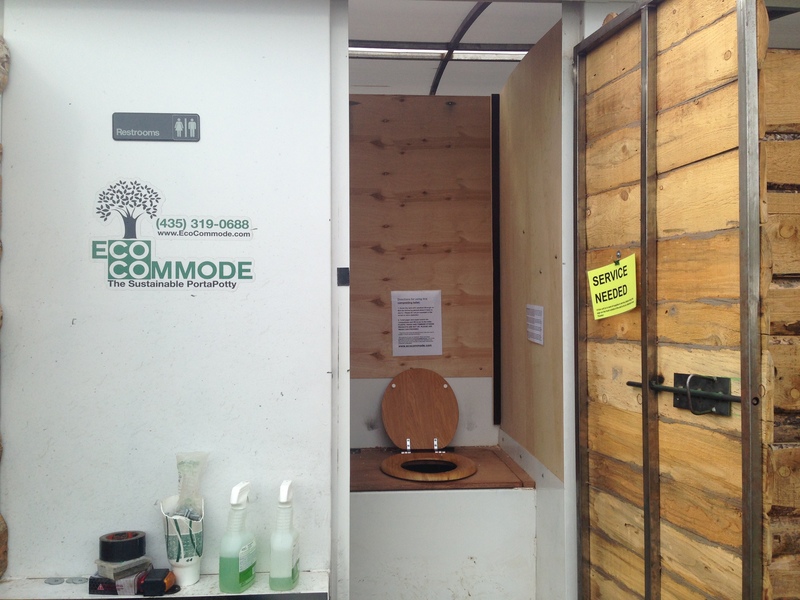 Bathrooms were eco-friendly and not nearly as nasty as port-o-potties. Start times seemed to correctly assigned – we started at 3:30 and finished just before 9 a.m.
Bikes at the transition area for runners to warm up on and also generate power for the event. A very green event – everyone had to bring their own reusable containers for water and coffee and solar power plus man-power in the form of the bikes. 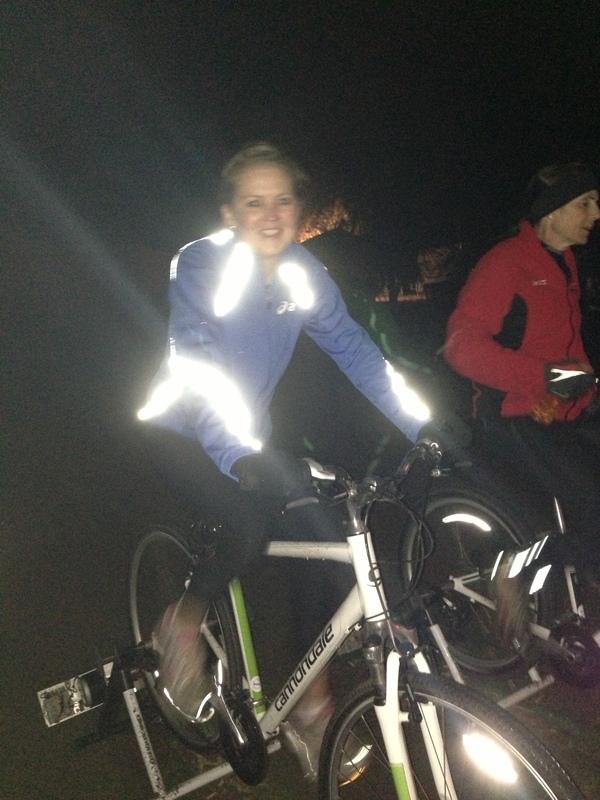 My team member Brooke biking to keep warm and generate electricity! Food – or lack thereof. Food was provided for purchase at all meals except for dinner on Friday which was a free pasta dinner. Unfortunately the lines were VERY long for all meals, especially the free meal on Friday night and the breakfast burritos on Saturday morning. We waited in the line for the free pasta and ultimately were disappointed by the very small portion sizes (a cup of pasta at most). We overheard a guy doing the Ultra really complaining since he was relying on that food for his fuel and was disappointed. WE brought a ton of our own snacks but next time I’d definitely bring more meal-like items. I felt like I was eating constantly and the provided “meal” was more like a snack. Not to mention, the lines really make it hard to get in your meal with time to digest prior to your next leg. The breakfast burrito line in the morning was over 45 minutes long according to someone we asked at the front. Coffee and hot chocolate were promised 24/7 yet there were several hour (or hours) long time periods when they were unavailable. It was very disappointing to not be able to drink coffee when it was very necessary to stay alert! Yellow Route was 1.4 miles shorter than advertised and we were never informed of this. Ultimately we were all happy it was shorter because all 3 loops were pretty difficult, but it’d be nice if they had at least told us! Mike was the first to run the yellow loop and we weren’t waiting for him in transition. He came all the way to the campsite and told Jeremy that it was time to run! He came in over 10 minutes faster than we expected. Results weren’t posted quickly. Thursday preliminary results were posted to the website. Shuttle from parking area to campsite was inconvenient and often had long wait times (it could be worth it to pay for VIP parking which gets you near the campsites, which is $25 in addition to the $!0 they were already charging). When we left, the shuttle service wasn’t quite as inconvenient but it’s really not fun to pack up your stuff, unload it in line for a shuttle, unload it, carry it to your campsite and then do it all in reverse again less than 24 hours later (another tip – don’t bring a lot of stuff!!!). Lack of shelter. 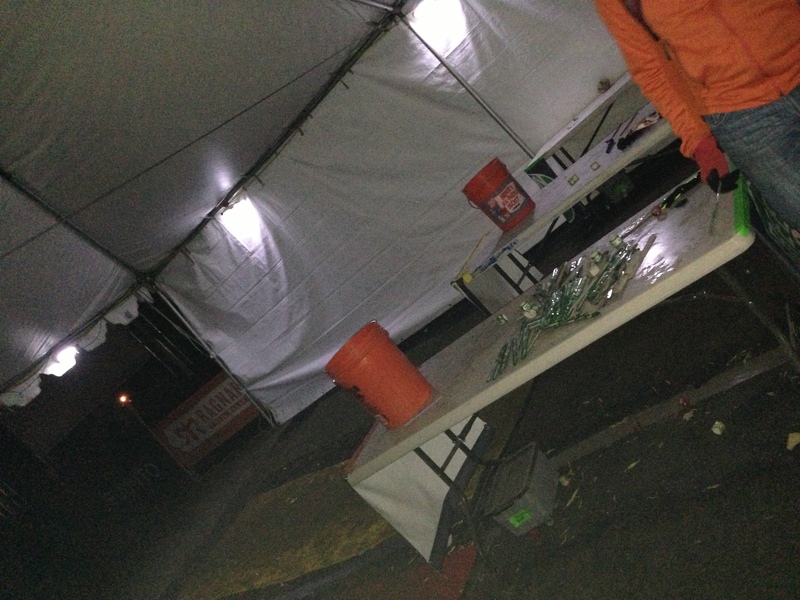 It misted/lightly rained for most of the night and there wasn’t’ really anywhere to go to get cover. The fire pit was crowded with people who were hovering around it rather than sitting on the straw bales of hay so there was really only room for a small number of people to get the warmth from it. This isn’t Ragnar’s fault of course and is expected when camping. I’d recommend bringing a camping pop up tent to put your things under in case of rain and lots of warm clothes! No open fires are allowed at your campsite. I didn’t really feel like there was a lot of downtime throughout the night. I was either prepping to run, running, waiting for Mike to finish running or sending off another team mate at all times. I barely had time to sleep let alone watch a movie! Live music – multiple musicians played music. Beer garden – I thought we might use this but since it was cold and we were tired when we finished at 9 a.m. we skipped the beer. 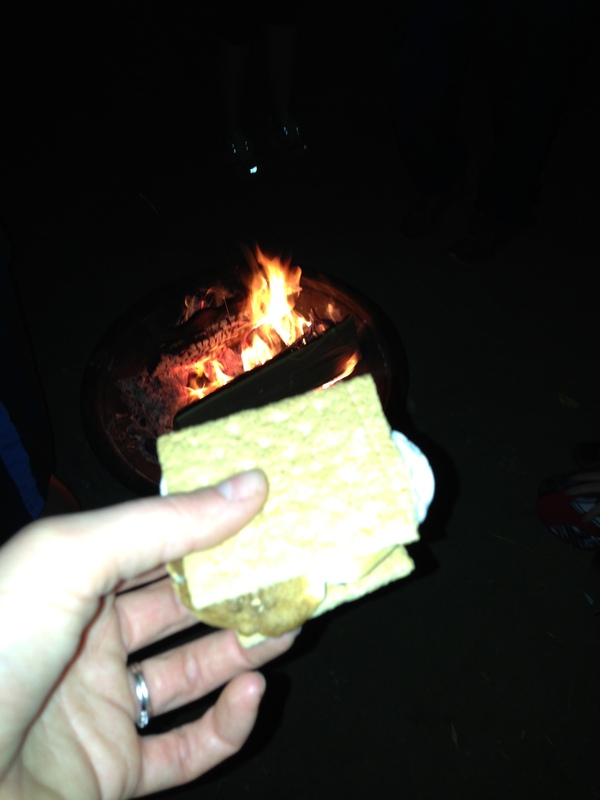 Guitar camp fire jams – there was supposed to be a guitar jam sessions for anyone to participate in around the fire but I’m not sure it happened or I just missed it. 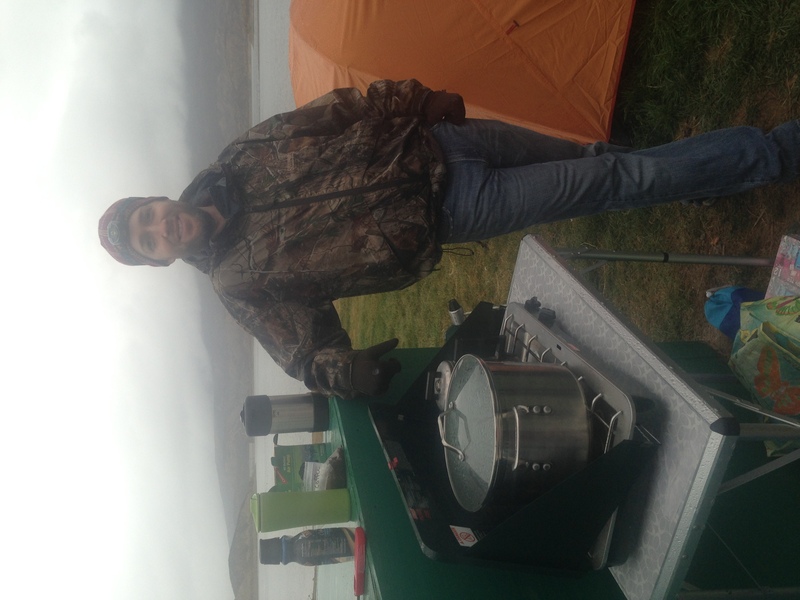 Good thing we brought a stove and coffee! Bring your own water. Although water was provided by Ragnar, you’d have to trek back to the main camp area to get it and if you forget your reusable water bottle you’ll be out of luck. Bring a ton of your own food. See above. Bring your own coffee if you absolutely need it and don’t like waiting. 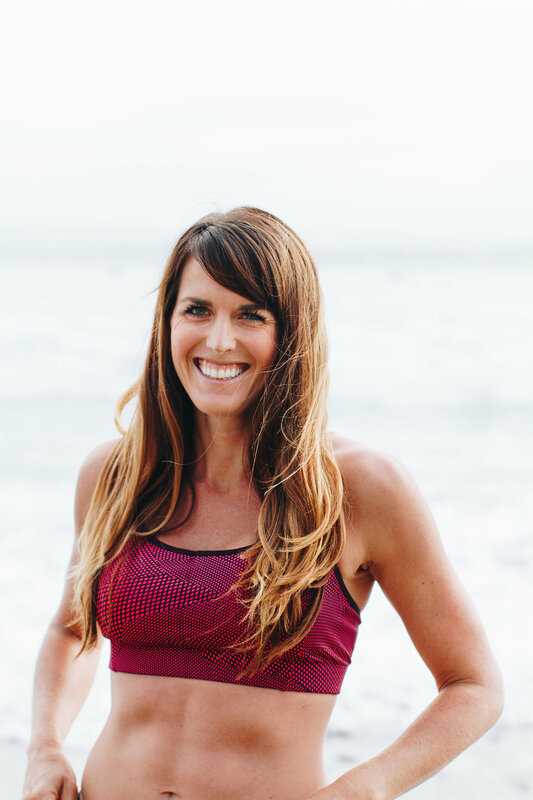 Bring 3 completely separate running outfits. I was really glad I did since they were dirty and sweaty. Bring warm clothes no matter what the weather forecast is. We originally thought it’d be in the 80s during the day and it ended up raining and in the 50s (this is cold for coastal San Diegans). Luckily I had a very warm jacket, uggs and plenty of layers so I was warm but Mike was pretty cold. Pay for VIP parking if possible. I think it’d be worth it! Wear a headlamp and carry and flashlight. Always greet other runners on the trails! Wear gaitors if you have them since Vail Lake trails are very dusty. 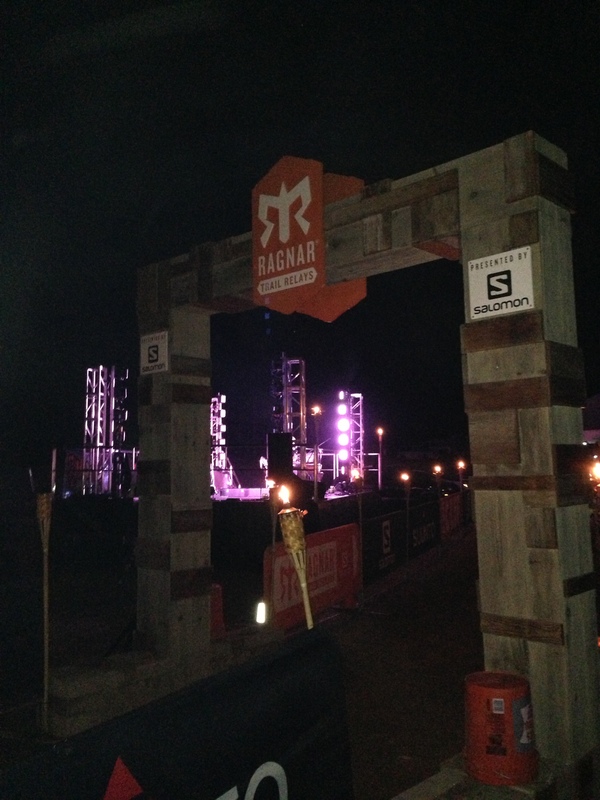 Do you have any interest in doing a Ragnar Trail Race? 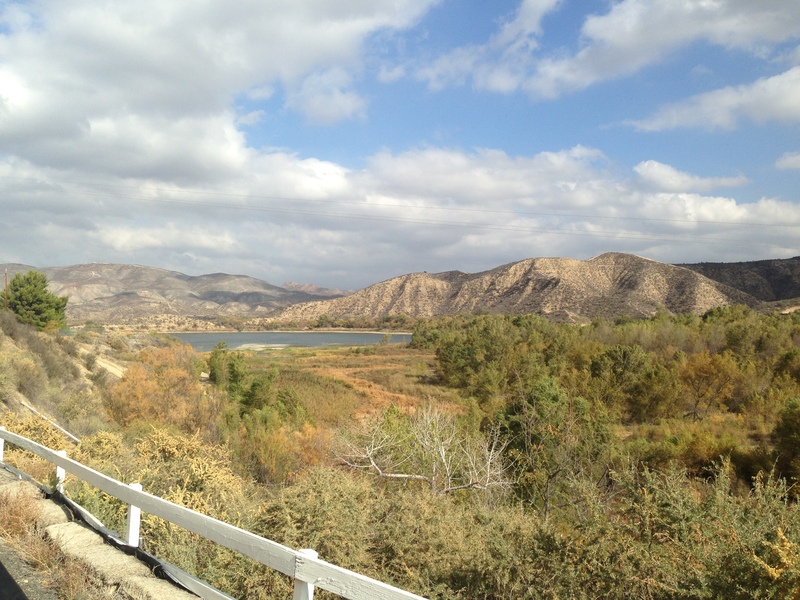 If you’ve done both Ragnar road and Ragnar trail, which do you prefer? Great review! 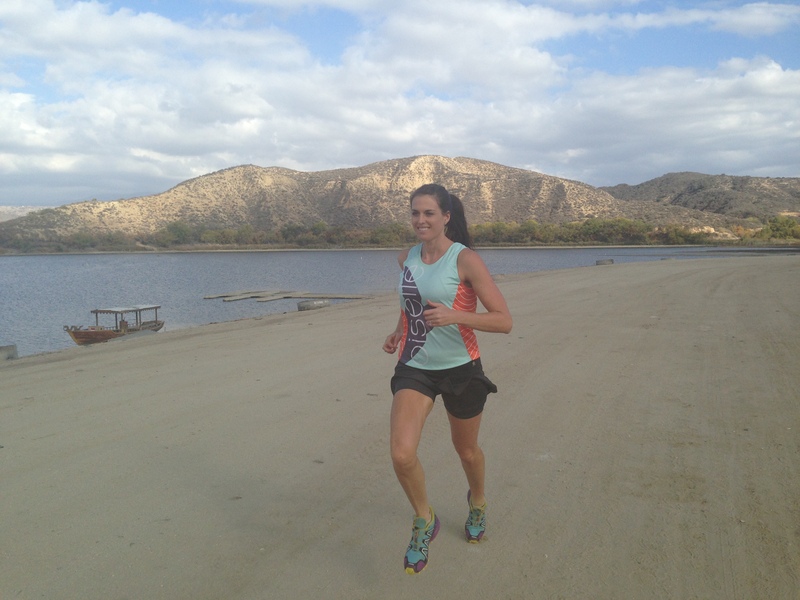 I want to do a Ragnar trail race next year, and your review was very helpful! The things you listed as good are the most important things to me–signage and communication–and the bad things will not be a problem for me at all–I like to cook in camp!–but are very important to know ahead of time! Thanks for the info! Sounds fascinating and like a lot of planning is required! The pros of the race sound awesome! Thank you for a Ragnar Trail recap. I have 2 teams doing the 1st New England one this year. I think your tips will help us. For the road relays people tag the vans, did anything like that happen at the trail? I’m not finding any information about that. Glad to help! No vehicles were allowed near the campsite so no one decorated them but the campsites were decked out!